The conservative-leaning Mercatus Center at George Mason University — which has gotten millions in donations from the Charles Koch Foundation — accidentally made an argument in favor of Medicare for All. The study’s executive summary highlights an astonishingly high figure — $32.6 trillion — as the ten-year cost of Senator Bernie Sanders (I-Vermont) Medicare for All proposal. While it may be tempting to focus on this figure, it’s important to remember that in 2017, Americans spent roughly $3.5 trillion on healthcare, or $35 trillion over ten years. And according to the Centers for Medicare and Medicaid Services (CMS), healthcare costs are projected to rise by 5.5 percent each year through 2026. Researcher Charles Blahous took the $32.6 trillion in new federal health expenditures (what the federal government pays), and then factored in the lower administrative costs, lower reimbursement costs, and lower drug prices that would reduce national health expenditures (what everyone else pays). When crunching the numbers, Blahous’ report found that Sen. Sanders’ plan for single-payer healthcare would provide more than $2 trillion in net savings in the program’s first decade. As the People’s Policy Project noted, this savings is more than likely an underestimate, as Blahous assumes administrative costs would drop from 13 percent to six percent, when administrative costs for Medicare are actually closer to just two percent. The new federal expenditures to cover Medicare for All would mean that Americans’ federal taxes would increase. However, when accounting for all the money American taxpayers would save by not paying monthly health insurance premiums, sky-high deductibles, and copays, even the higher federal taxes would mean American households would have more money in their pocket under a Medicare for All system. CMS found that in 2012, the average American spent just shy of $10,000 on healthcare in 2012 — nearly $3,000 more than what Americans spent in 2007. And that cost is projected to continue to go up dramatically to as much as $14,944 by 2023. 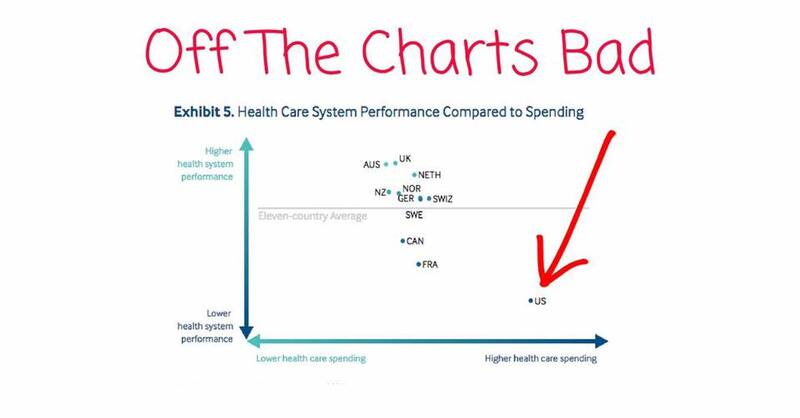 Even as early as 2015, Americans were already spending more than double the per capita average of other developed countries on healthcare. [I]npatient to outpatient care; preventive to emergency care; primary care to specialty care, including long-term and palliative care; vision, hearing and oral health care; mental health and substance abuse services; as well as prescription medications, medical equipment, supplies, diagnostics and treatments. Patients will be able to choose a health care provider without worrying about whether that provider is in-network and will be able to get the care they need without having to read any fine print or trying to figure out how they can afford the out-of-pocket costs. Major media outlets are breathlessly reporting on the $32.6 trillion figure, with the AP fully adopting the framing of the new costs rather than the net savings. House Speaker Paul Ryan (R-Wisconsin) tweeted a link to ABC’s version of the story while decrying the $32.6 trillion cost. However, beltway outlet Axios pointed out at the very bottom of its story that Medicare for All would actually save money.